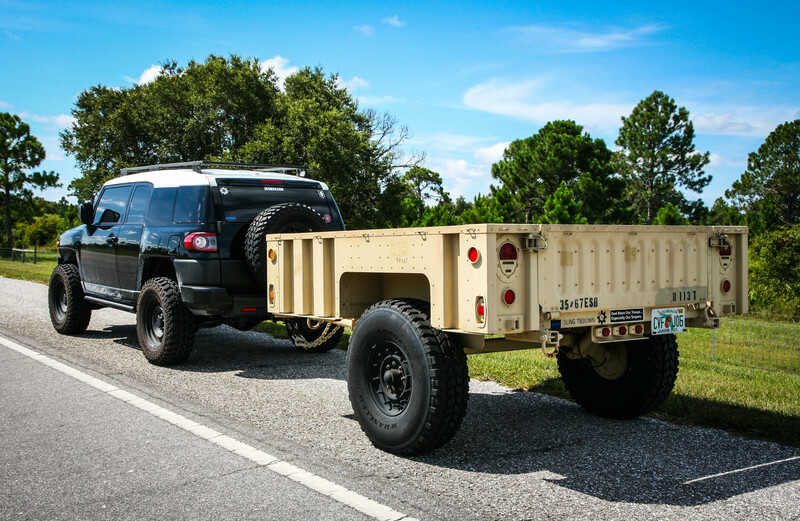 It appears the .gov has been putting M1101 and M1102 trailers in auctions recently, and more and more are making their way into enthusiast hands. Having purchased two myself from govliquidation.com, a M1101 and M1102, I’m putting down what I’ve learned so far. What’s the difference between the M1101 and M1102? Physically between the trailers there’s no difference. 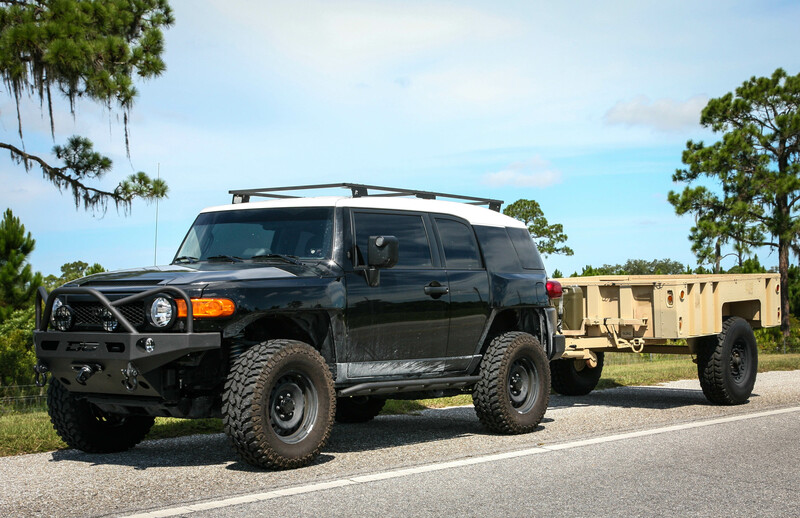 From what I’ve gathered, the bumpers on the tow vehicles, HMMWVs, were found too weak to tow the trailer at it’s maximum designed weight of 4200Lbs. So a different pintle/mount system came out for the HMMWVs came out, allowing the towing of M1102 units. Light HMMWVs were limited to tow the M1101, identical to the M1102, but weight limited to 3400Lbs. M1101 can be towed with light HMMWV M998/M1038. In the non-military world, it should be no problem loading either to the maximum of 4200Lbs. Vehicle cable is routed directly to the terminal junction, located underneath the trailer. In order to wire for 4 or 7 pin, simply remove the clamps holding the vehicle harness in place, and disconnect from the junction. I ended up cutting the connectors off of the harness and reusing them with a 4 pin harness. The wires are identified with a metal tag crimped on the wire by the terminal end, with the wire number stamped into it. White wire = Ground, ground on existing ground stud. Pin 1, White wire = Ground, ground on existing ground stud. 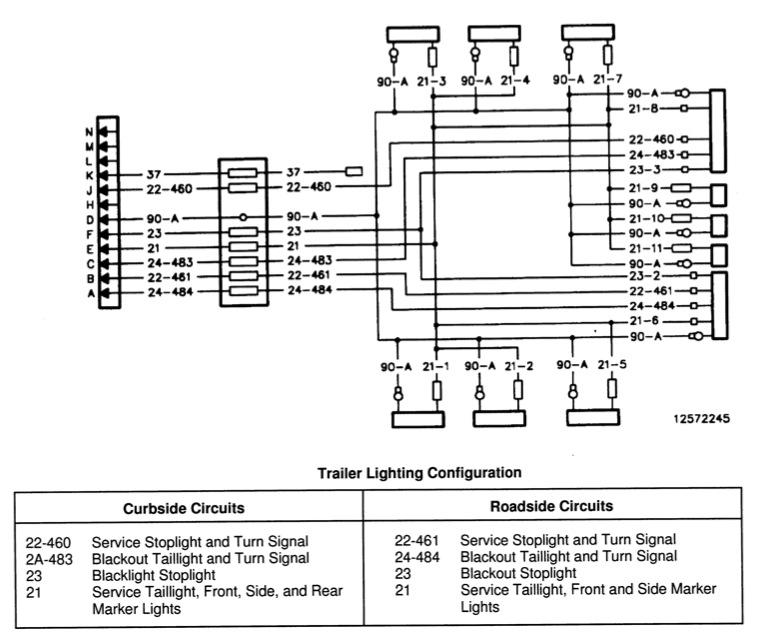 These 4 wires are the only ones necessary to operate the normal lighting system of the trailer. The rest of the wires can be ignored. The tail light bulbs can be removed and the following bulbs can be installed, use bulb#1156 to replace original bulb 1683 and use bulb#67 to replace original #623. The marker light bulbs can be exchanged as well, bulb type#96 seems to be the replacement. I have not confirmed this yet. Another option for the tail lights is the installation of a multi-volt Truck-lite LED unit, found here. 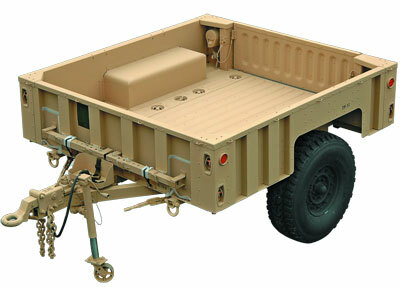 There are 3 MWO’s that apply to these trailers: (MWO’s are like Service Bulletins or Recalls on cars). The first two MWOs only needed for trailers built under contract number DAAE07-94-CR014, the original 1994 contract. The trailer’s contract number can be found on the trailer data tag. I have yet to find or make PDFs with details of the MWOs, once I do I’ll post it here. All I can say for now, is make sure, especially on the 94 contract trailers that the MWO’s are complied with. 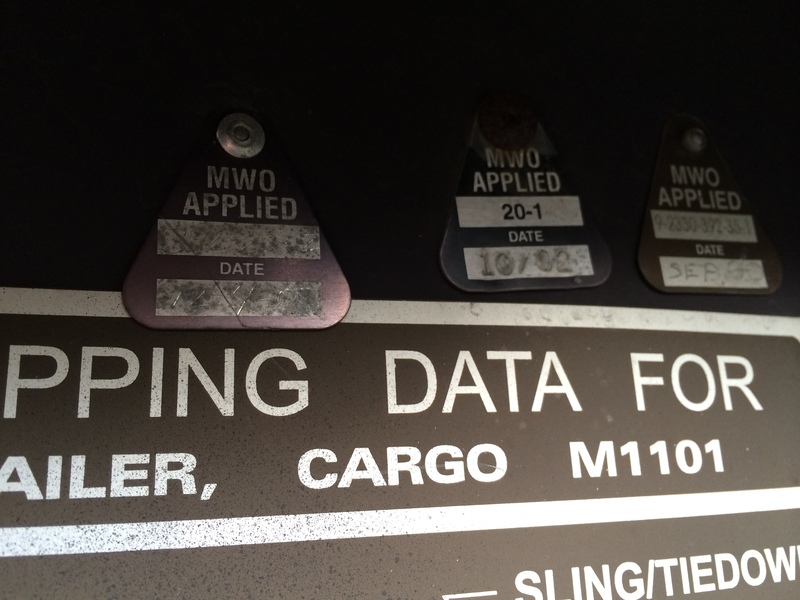 Compliance can be verified by looking at the MWO compliance tag, attached to the FWD side of the trailer. 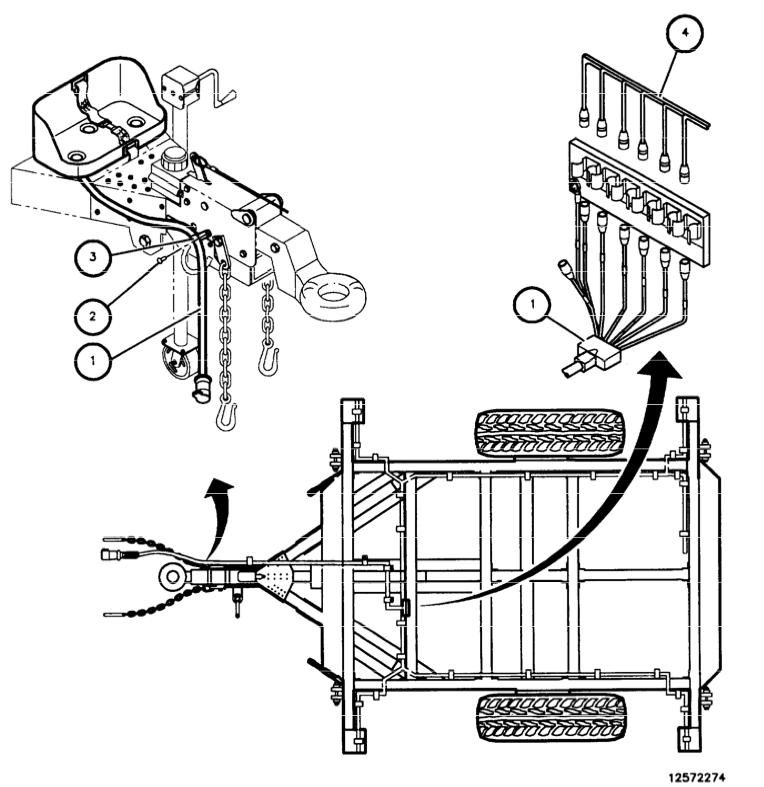 The drawbar is quite high on the trailer, at 29.5″ much higher than most vehicle’s trailer hitch attachment. It appears the HMMWV wheels can be exchanged with GM 8 bolt wheels, dropping the entire trailer down considerably using smaller tires. Another option is a pintle riser on the tow vehicle. Not my personal favorite, as a trailer attachment that high up comes under a lot of lateral forces. Another downside of this is that some tow vehicles will be unable to open their tailgate with an extension that high. Personally, I went with a lunette ring extension. I took the drawbar out, and had a 6″ U channel and filler plate welded in. Hello, I sent you a message on Steel Soldiers, but I thought I would also post it here. I noticed your modification to the Lunette and I am thinking of doing the something similar but I have a few questions for you. Are you still happy with the M1101 Lunette modification? Have you had any issues with it? 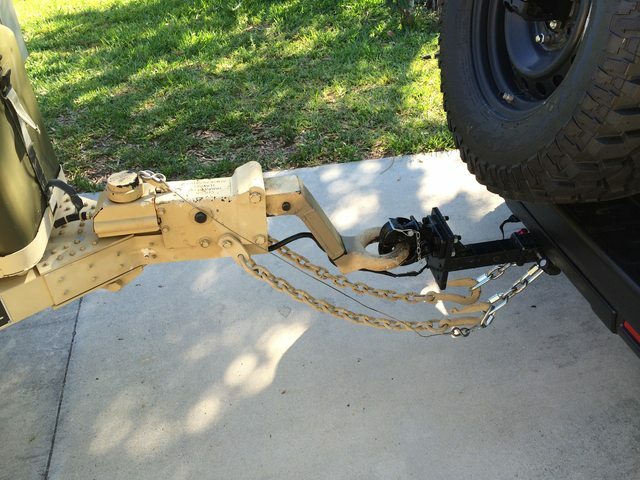 How heavy have you loaded the trailer and towed using this modification? Thanks very detailed you are awesome! I have a camo M1101 I ended up trading for. I love this thing and did the exact lunette drop extension as you have. I have had NO issues with this while loading the trailer even over the limit and towing at speeds upwards of 75-80 mph. It is just a great trailer and is steady as it can be. DO NOT place heavier items near the tailgate or back of the trailer as this will promote fishing tailing at moderate speeds. Always keep the load at 70% total weight forward of the wheels. Anybody know of another source? Nothing else wrong with the assembly so I hate to buy a whole third leg, just for two gears and two pins! ?